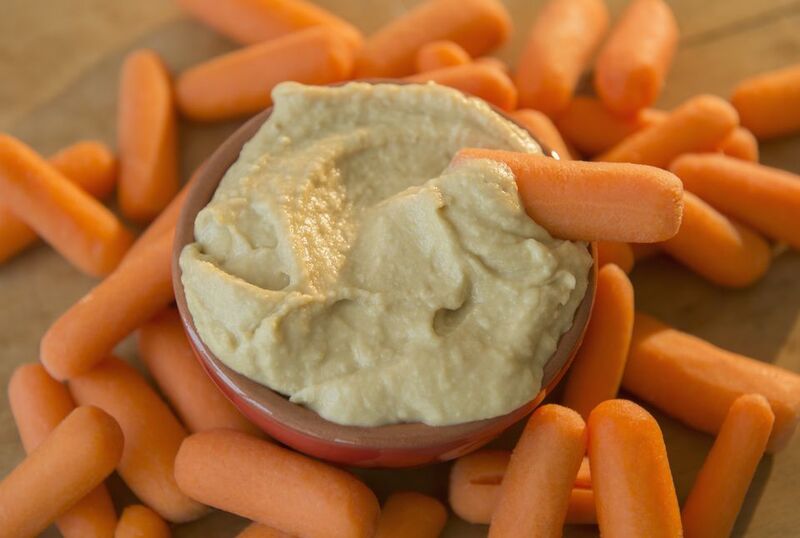 Hummus can get a bad rap for its high fat content, most of which comes from the tahini in the spread. Made of ground sesame seeds and oil, tahini lends a smooth texture and signature nutty flavor to the chickpea mash. This easy hummus recipe replaces most of the traditional tahini with yogurt, making it a good lower-fat alternative. You can serve hummus as a dip for vegetables or pita chips, spread it on a sandwich as a protein-boosted condiment, or use it to dress a salad or a bowl of pasta. Once you master the basic recipe, it's easy to customize your hummus by substituting different beans for the chickpeas, or adding different flavors and textures with chopped sun-dried tomatoes, olives, and fresh herbs. In a food processor, combine beans, garlic, lemon juice, tahini (if desired) and yogurt. Blend well. Add salt, and blend until smooth and creamy. To thin the hummus (if desired), add a little of the chickpea liquid about a teaspoon at a time. You can also mix in warm water or olive oil to loosen the spread even more.